Parenting is a journey of discovery, and one of the lessons we learn (sooner, ideally, than later) is that there are aspects of our children’s lives we can control and many more we can’t. When we have two or more children, it quickly becomes apparent that we have very little control over their sibling relationships. Yes, we can teach our children to treat each other with empathy and respect by modeling those practices ourselves, parent to child (and then being patient, because this kind of learning takes time and maturation). But there is nothing we can do to make our kids want to be together. 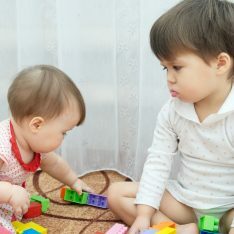 We can’t make them best friends, and any attempt to steer or meddle in these relationships usually backfires, because our judgmental interventions tend to create guilt, shame, and “bad guys.” Naturally, children placed in this position will blame their sibling. What we can do is work on keeping our kids safe while accepting their ups and downs and all the messy feelings and behaviors that go with the territory. If we allow for the lows, there will actually be more genuine highs. So, our challenge is to judge and project less, accept and empathize more — entrust our children with their relationship. My second baby was due to arrive when my first child was 2.5 years, and I was really looking forward to pure nesting time. 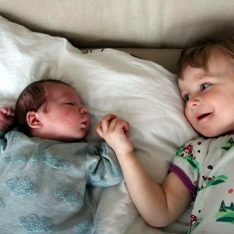 I had images of bonding all winter with my 2-year-old and newborn. Then our new baby arrived. I was not even able to hold or nurse my new baby in the same room as the 2-year-old without blocking him from trying to hit his brother. He clearly did not like his new sibling nearly as much as I had hoped and fantasized. As my new baby grew older and I began to place a few toys in his fenced-off play space, the toys would disappear. My 2-year-old would lift up the fencing, crawl under and remove whatever the baby seemed to enjoy most. I found teething rings hidden under the couch and his pillow. 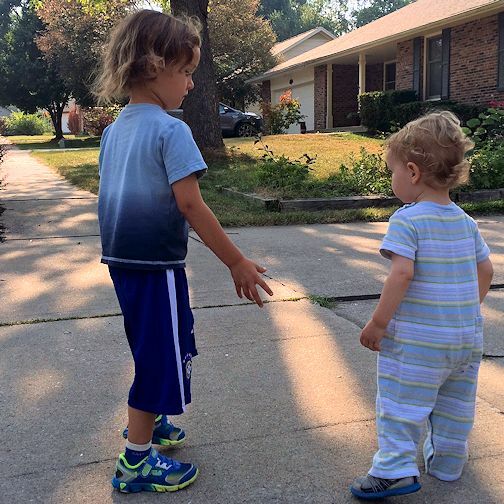 After several months, as my now 3-year old became more vocal, each night he would offer suggestions for getting rid of his brother: put him out with the trash by the curb; leave him in the forest for a deer family to raise; or give him away to a neighbor or friend. He would also ask me if his little brother could “die sooner,” or tell me about how much he wished his brother would hurry up and become a man so that he could be an only child again. All of this was hard for me to hear initially…..but RIE had taught me that accepting these feelings was the way to go. So every day I would listen and say something like, “I hear you, you really want to put your brother out with the trash. That is a normal thing for you to want.” My oldest would then light up and hopefully ask, “Can we?” To which I would reply, “No, we can’t, but I really understand how much you want that.” When I told RIE Associate Lisa Sunbury Gerber about this, she recommended the book Too Small for Honey Cake. In this book an older brother talks about wanting to send his newborn brother away to a zoo or put him in the trash bin. Needless to say, my son related immediately. He loved the book and often asked me to re-read the pages about sending the little brother away. As the months passed, there were some good times, but my oldest still did not seem to like his brother too much. There were a lot of attempts to hit the baby. I began to have my doubts and felt I really needed to “fix” their relationship. The hardest part for me was coming to terms with my feelings about them “not liking” each other. I never really struggled with the toy issues because I thought of it this way: what is more important — making sure my youngest gets to play with that particular ball that his brother just took out of his hands, or making sure that my kids can build a relationship over time that is theirs and that is not tainted by my judgement or expectations or wishes. If I get in the way by judging, fixing or controlling things, I am actually taking something away from both children. Part of what kept me going was seeing how they looked towards each other, and not towards me, when figuring out toy issues. They were figuring out their relationship rather than turning to me to solve things for them. Although other people around me were sometimes appalled by how I “let” my 3-year-old take toys from his little brother (I even lost a friend over this), I could clearly see how little (if at all) my youngest child cared about the toy taking. In fact, he often seemed quite fascinated watching his big brother grab up and hide the toys! And I routinely gave my children time apart in separate play spaces, so I knew that my youngest did get plenty of time to play with toys. What happened next was pretty amazing. By about the 8-9 month point, my oldest was regularly giving toys to his little brother and even choosing the ones that he knew his brother liked the best. Sometimes my oldest would take a toy out of his brother’s hands but then, unprompted, he would go and place it back into his brother’s hand. This was a turning point. At about the one year mark, it became clear to me that my children were developing a loving, caring and authentic relationship all their own. One of my first memories of this is that my oldest had a ride-on tractor toy that his little brother was not able/ready to climb onto, so he came up with the idea to turn the toy tractor on its side so that the two of them could pretend to be mechanics together. I kept maintaining separate play spaces for them and let them choose when to be together. Gradually they began to want to be together more than apart, and eventually my oldest told me to dismantle the separate spaces. His “projects” in the playroom are now protected just by conversation and mutual agreement with his little brother. The other day I told my kids I had to make a phone call, then I would change the one-year-old’s diaper and we would go out. When I came back, my four-year-old was in the middle of changing his brother’s diaper (while talking him through the diaper change!). 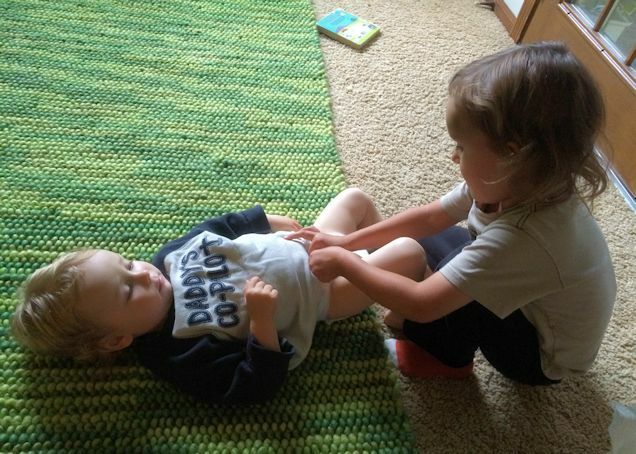 The little one was cooperating and lifting his body up to help his brother change his diaper. Then we went to a garden, and anytime the one-year-old was thirsty, his brother would hold his cup of water for him or bend the straw for him so that he could take a drink. They amaze me every day with how close they are, how much they enjoy each other’s company, and how kind they are to each other. The older boy now constantly looks out for his brother. They work out not just toy issues, but they also verbally work out “protecting anyone’s project” in the playroom separate play spaces. I thank RIE for encouraging me to give them space to work things out on their own and for encouraging me to let their relationship just be whatever it is….without trying to make it anything. The authentic friendship I now see has been more than worth the journey as they struggled to get to know each other and build their relationship. Thank you so much, Brettania, for sharing your story and photos! This was really really good to read. I hope my children are like this when they are older. Thank you for sharing this. I loved the diaper changing picture. My 2 year old right now hits my 3 month old all the time. Really hard, in his face. Over and over again. I am out of ideas on how to get her to stop. any ideas? It’s very important to have a safe place for your baby, so that you can prevent this dangerous behavior. I would not leave them alone together. If you are there, stop your child from hitting (by placing your hand in her way or getting between them, if you need to) while also acknowledging, nonjudgmentally, “You feel like hitting. I will stop you.” If you say any more than that, I would only keep acknowledging, “You want to hit. You feel like hitting”, while capably preventing her from doing so. This lets her know that you are okay with the feelings she’s expressing with this action, but that you will not let her follow through with the action. If she can express these feelings to you safely this way, she will be less likely to act on them. thank you so so much Janet. I am definitely going to say that from now on and tell my husband as well. When you say “If she can express these feelings to you safely this way, she will be less likely to act on them” are you referring to her expressing these feelings by hitting? Or some other way? I wasn’t sure since you said she would safely express them. What I am saying is that if you let her know in those moments that it’s okay with you that she feels like hitting (while also letting her know that you won’t let her carry that out), she will feel safe expressing to you her feelings around this difficult transition. Thank you for this post, and for your wonderful blog Janet! I have *tried* not to intervene in the relationship between my 3.5 yo and 11 mo, specially regarding toy taking. But, unfortunately it was not possible for me to give them a separate play space and I’ve mediated more than I would have liked to. Now, I feel they rely on me to intervene everytime one of them takes each other’s toys and since they share the same playspace I need to be constantly monitoring and helping them out. I would like to give them more independence and let their relationship develop without constant mediation from me, but I don’t really know where to start. I’d appreciate it if you have any ideas? 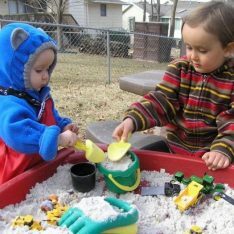 I have a similar situation to you Juanita – it’s almost impossible to give my son (17 mo) and daughter (3.5yr) separate play spaces in my small home. Now my smaller one can climb he can get up to the table where his sister used to have her ‘safe space’ for colouring etc so now she has nowhere safe from his playful hands and he definitely has nowhere safe from her! All ideas welcome! I have been able to see so many of these beautiful moments with my two children, now 2 and 6, as well. The struggle we have is my 2 year old respecting my 6 year old’s space. I struggle to find any suggestions on how to handle this dynamic, it’s always the older adjusting to the younger. Our struggle is greatest is after school and I begin paying attention to my oldest after being with my youngest all day. Any help would be lovely. How essential do you think it is to have separate play spaces for siblings? If it is important, how do you suggest enforcing this with the older sibling who can open gates etc? I’m in the UK where houses are often smaller than in the US. Unlike many of my friends, our house is large enough to have a room that we have managed to make completely safe for a toddler. However, we don’t really have much more space than that downstairs. My elder child has his bedroom but he always wants to play downstairs rather than up in his bedroom. And ultimately they both always want to be wherever I am. How do you suggest handling this? They play together very happily much of the time, but sometimes it clearly gets too much for them both. This is such an inspiring story! I hope we can get there with my familiy. I have a 3 week old and a 22 month old. For the first two weeks my oldest often had big cries when I had to breast feed and she couldn’t have my lap all to herself. We did our best to acknowledge her sadness and talk about how hard it is to have to share me with a new baby brother. She seems to be dealing better with breast feeds now, and will sit beside me while we read books together. However, she has started responding very intensely to other challenging moments, for example having to put on a jumper she doesn’t want, and immediately starts crying and saying ‘I’m upset, I’m tired, want to have a sleep in the buggy’. This is happening numerous times a day now. She is only allowed her dummy when she is sleeping, and I am pretty sure it is this comfort she is really after, I have been going with it, putting her into the buggy and tucking her up with her dummy and blanket. She very rarely goes to sleep unless it is at her normal nap time. Once she calms down she renounces the dummy and asks to get out and play again. I am really unsure about whether I should be going along with this. Part of me feels like these little comfort retreats are what she needs, but another part of me worries that she is seeking comfort from the dummy when actually she just needs more quality time with me. Myself and my husband are currently centring everything around giving her quality time so it is not that she is missing it too much, although she is definitely getting a lot less from me than before. I am finding it really upsetting that her underlying lack of ease is so strong that tiny things set it off and she just wants to retreat from everything with her dummy in her buggy. I would really like some advice if possible!